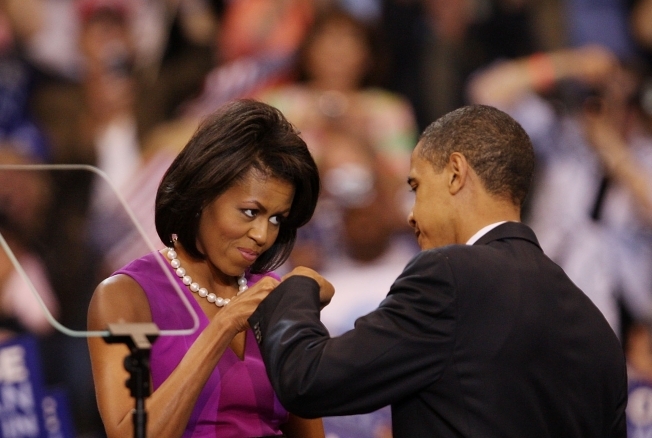 The "terrorist fist bump" seen 'round the world. The media took its share of lumps this year, with persistent claims of bias and complaints about often wrong-headed speculation from a seemingly endless parade of talking heads. Of course, there was great reporting, with journalists breaking news and penning terrific profiles of the candidates and the campaigns. TV ratings and Web traffic were through the roof, evidence of huge voter interest. But there were plenty of missteps on the way, and Politico’s compiled a list of 2008’s greatest blunders (along with a look at how the media responded to each). Were there worse media mishaps we've missed? Politico invites readers-never shy to tell us reporters when we're wrong-to comment below and let us know what should have made the cut. 1) New Hampshire primary: Pundits predicted a campaign-ending, double-digit loss long before the polls closed, and some networks, perhaps disbelieving the results, didn’t call the election until after Obama had already conceded. "I will never underestimate Hillary Clinton again,” Chris Matthews said on MSNBC. Response: The New Hampshire debacle came up again and again, especially when cable talking heads began saying Obama had sewn up the nomination. But many pundits, perhaps wary of repeating their previous mistake, kept up with the claim the race was neck and neck well after the delegate math no longer gave Clinton any opening. 2) The New York Times' McCain-Iseman story: There was so much hype leading up to The Times front-page investigation of John McCain’s relationship with lobbyists—dating back at least to a Drudge leak two months earlier—that without something concrete, the story was doomed to fail. Executive editor Bill Keller said there’s more to the piece than the strongly suggested, never outright stated, romantic relationship between the senator with lobbyist Vikki Iseman, but that’s what the public seized upon. The Times put it out there, but couldn’t prove it, leading both the right and left to slam the piece. Response: The campaign sparred publicly with the Gray Lady throughout the campaign, using the liberal media as a whipping boy when needing to rally the base, and the paper often appeared to return the favor, most notably in an hostile October profile of wife Cindy McCain. Response: Even-keeled NBC utility player David Gregory took over as anchor, allowing Matthews and Olbermann to let their opinions run free. Response: Hill’s contract wasn’t renewed when it expired in November, and the producer responsible for the “baby mama” line went to CNBC. 5) “Pimped out”: MSNBC’s David Shuster said that Chelsea Clinton was being “pimped out” by the campaign for calling superdelegates on her mother’s behalf. The Clinton camp and NBC executives became embroiled in a tense back-and-forth, with the Democratic contender threatening to withdraw from a network-sponsored debate. 6) ABC Democratic Debate in Philadelphia: Co-moderators Charles Gibson and George Stephanopoulos faced plenty of blowback following the Obama-Clinton debate for spending the first half focused on what many complained were trivial issues—his relationships with Rev. Jeremiah Wright and Bill Ayers, and his stance on flag pins. 7) National Enquirer’s Edwards story: During the primaries, mainstream media outlets, this one included, declined to report on the National Enquirer’s shoe-leather reporting on John Edwards’ affair, even after their reporters caught him visiting the woman at the Beverly Hilton. Bloggers kept the story simmering while most news organizations ignored the mounting evidence—that is, until Edward finally came clean on ABC after he'd already dropped out of the race. 8) New Yorker’s “Politics of Fear” cover: The Zabar’s set were in on the joke. But some didn’t see the humor in the illustration of Barack and Michelle Obama, sharing a terrorist fist-jab and dressed respectively as a Muslim and Angel a Davis-style black radical, with an Osama painting on the mantle, and AK-47 leaning against the fireplace, in which burned the American flag. Response: Both campaigns slammed the cover, and rumors flew that New Yorker writer Ryan Lizza was kept off the campaign’s overseas trip as a result. But now, both Lizza and editor David Remnick, the former who’s excellent piece on Obama in the same issue was largely overlooked in the ensuing dustup, are working on books dealing with Obama. 10) CNN’s Drew Griffin misquoting the National Review: CNN finally got an interview with Sarah Palin, but ran into trouble when Griffin read part of a National Review story to the Alaska Governor: “I can't tell if Sarah Palin is incompetent, stupid, unqualified, corrupt, or all of the above." Turns out the author, Byron York, wasn't taking a shot at Palin, but at the media for portraying her as those things. Response: The incident fed straight into the narrative that mainstream outlets weren’t giving Palin a fair shake. Griffin apologized on-air for taking the quote out of context, and personally to both York and editor Rich Lowry.